If this is the first time you are setting up a rabbit cage, Congratulations! Owning a rabbit can be a really fun and rewarding experience. When it comes to the question of what do rabbits need in their cage, there are the things that would be nice to have, and then there are items a rabbit will really need. 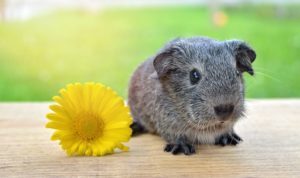 The must have items relate to feeding and giving water to your rabbit. 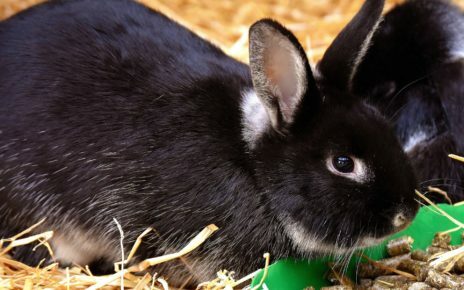 The other non essential items can be added at your leisure, but they should be added to make the cage more comfortable for the rabbit over the long run. What do Rabbits Need in their Cage? Since water is the most important thing your rabbit will need. Finding a good water bottle should be the first thing you do. 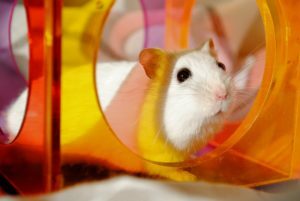 Since rabbits are a lot larger than other small pets like hamsters and gerbils, you will need a large water bottle that holds more water. Any water bottle that holds at least twelve ounces is sufficient for a rabbit, but a larger bottle is always better. Going with a larger water bottle will actually be the best course of action. First off you never want your rabbit to be without water, so getting a larger bottle will give you some added peace of mind that your rabbit will always have water. And you will have less work to do, since you will have to fill the water bottle less often. 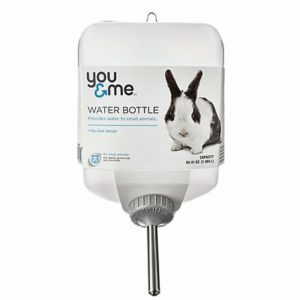 The You & Me Jumbo Small Animal Water Bottle, is perfect if you want a really big water bottle for your rabbit. At sixty four ounces, this water bottle could last one rabbit up to a week before needing to be refilled. Or if you have multiple rabbits, you can be sure they all are getting enough water without the risk of the bottle running out. The Kaytee Chew Proof Water Bottle is a good choice if you have a single rabbit. The twelve ounce capacity should last a single rabbit about 1-1.5 days. The rugged chew proof design will also ensure you get a long service life out of this bottle. Once you have your rabbits water needs met, the next thing your rabbit will need is food. 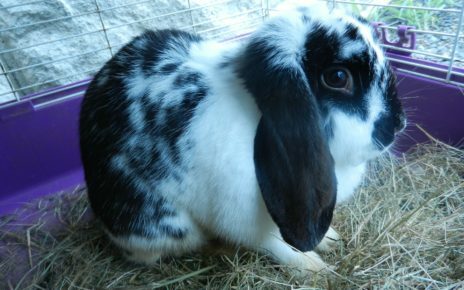 A rabbit will need a varied diet that consists of a mix of pellets and hay. The pellets will need to be served to your rabbit in a sturdy bowl. It’s very important to get a bowl that’s not easy to knock over. If the rabbit knocks the food out of their bowl, the food will fall through the mesh floor and the rabbit won’t have any food to eat. Another nice thing to have in your rabbits cage is a hay feeder. 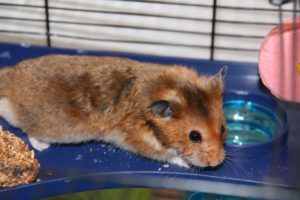 A hay feeder will keep the hay clean by keeping it off the floor of the cage. Having a hay feeder will also make feeding time a little less messy, and it will help reduce waste. 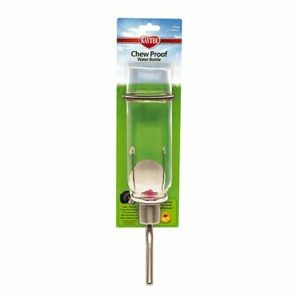 The Kaytee Hay & Food Bin Feeder, is the best all around feeder for a new rabbit cage. The feeder clips onto the wall of the cage so it’s pretty much spill proof. And the feeder also has a nice sized dish to hold the rabbits food. It also comes with a built in hay holder, making this feeder a perfect all in one solution for your rabbit feeding needs. 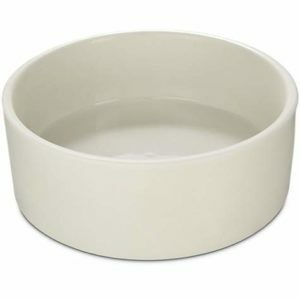 The You & Me Eggshell Dish, is a nice heavy weight large bowl that will hold up well in a rabbits cage. If you want to feed your rabbit their pellets in a sturdy bowl that won’t tip over, this high-quality ceramic rabbit bowl is a good choice. 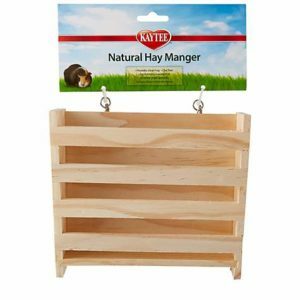 The Kaytee Small Animal Natural Hay Manger Feeder, is a good choice if you want a nice looking hay holder in your rabbits cage. 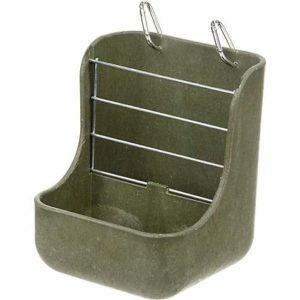 This hay manager is also made of all natural untreated wood, so it will be safe for your rabbits. Once you have your rabbits bowl or feeder, you will need a high-quality food to put in it. Since rabbits evolved to mostly eat grass and other roughage in their natural environment, it’s important to provide them with a similar diet in their cage. Always buy a pellet food that is specifically designed for rabbits and not other small mammals. A good rabbit food will contain a high percentage of fiber relative to any other ingredients. The fiber in the feed will help keep your rabbit happy and healthy. 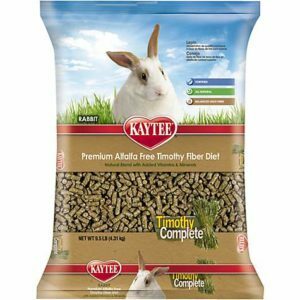 Kaytee Timothy Complete Rabbit Food, is a good choice if you prefer to feed your rabbit a hay based rabbit pellet. 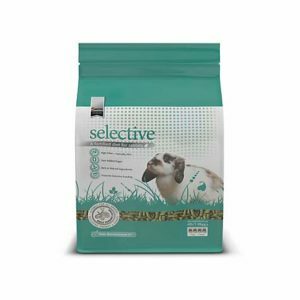 This rabbit food is very healthy for a rabbit, and not only is it high in fiber, but it also has added probiotics to aid in digestion. Another necessity for a rabbit cage is hay. While a good rabbit food usually contains hay or some other source of fiber. Giving your rabbit loose hay still has many other benefits. One of the main reasons to keep hay in your rabbits cage is to give them something to chew. Since a rabbits teeth are always growing, they need to be constantly chewing in order to keep their teeth filed down. If a rabbit doesn’t have a good supply of hay, they might start chewing on the bars. Or they even might destroy their water bottle, or anything else they can find in their cage. If you keep a constant supply of hay in your rabbits cage, it should limit any unwanted chewing behaviors. Oxbow Hay Blends Western Timothy and Orchard, has a mix of two different kinds of hay. The first ingredient is the familiar timothy hay, and the second type of hay is orchard grass. 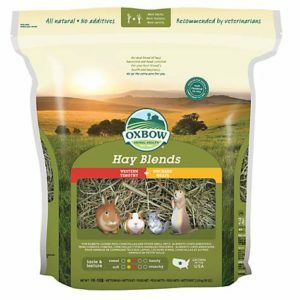 A nice blend like this will give your rabbit some added variety. And the orchard grass will provide a better mix of nutrients compared to feeding them timothy hay alone. 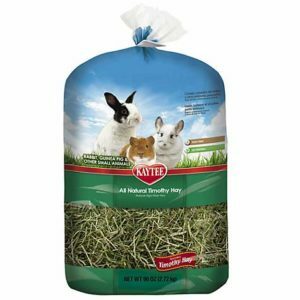 Kaytee Natural Timothy Hay for Rabbits, will help keep your rabbits happy and healthy. This hay contains only natural sun dried timothy hay. 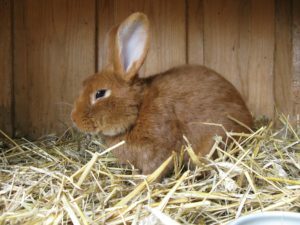 And the hay contains no preservatives, making it a natural safe and healthy treat for a pet rabbit. You can put off getting a hideaway at first, but eventually you will need to get one. A rabbit hideaway will give your rabbit a strong sense of safety and security. Since rabbits spend most of their day hiding in nature, a hideaway can help mimic that feeling when they are kept in a cage. A rabbit that has a nice place to hide will be less stressed and in most cases friendlier. A hideaway will give a rabbit a place to go if they don’t want to be bothered. If a rabbit doesn’t have this option, they may become aggressive, which could lead to biting and other problems. 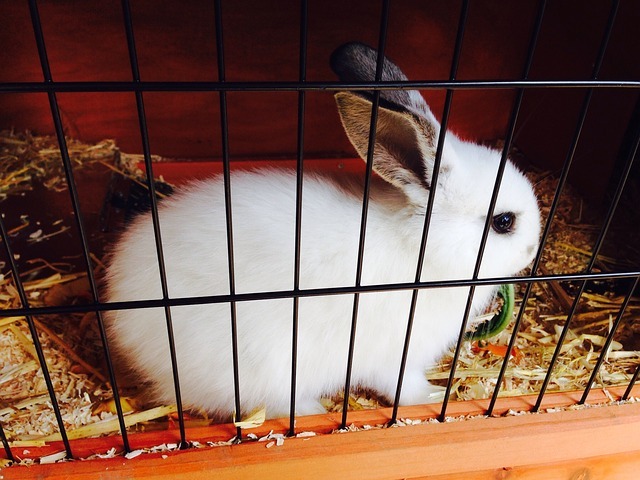 Selecting a good hideaway will go a long way towards making your rabbit feel at home in their cage. The WARE Rabbit Den, is a large box shaped hideaway with plenty of room for even multiple rabbits. 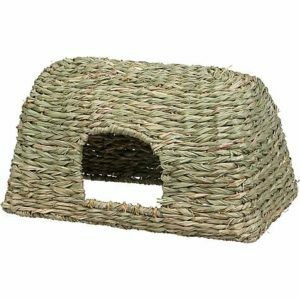 The WARE Rabbit Den is made out of sturdy wood and will withstand some chewing without suffering any major damage. The WARE Farmer’s Market Nature’s House, has an attractive rustic look . This rabbit hideaway can add some charm to any rabbits cage. It has enough room for one full size rabbit, or a couple of bunnies. One downside is that the hideaway is made of dried grass, which means a rabbit will easily chew right through it. 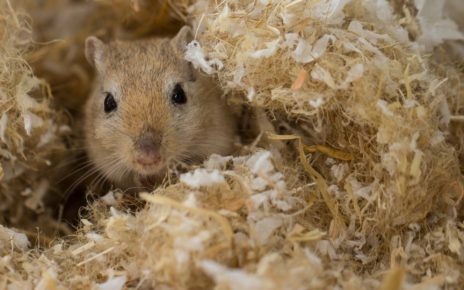 For this reason you should consider this hideaway a temporary shelter, and a long term source of fiber. In most cases you probably won’t be breeding your rabbits, but if your rabbit does get pregnant she will need a nesting box. Female rabbits need a safe place to have their kits. 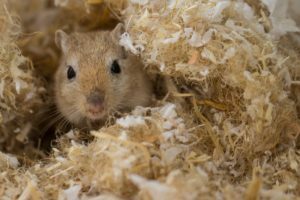 If you don’t provide a nice nesting box there could be complications with the pregnancy, or the kits might not even survive. When a rabbit is about to give birth she will start to pull hair from her stomach and try and make a nest. If your rabbit is in a cage with a wire floor she won’t feel comfortable building her nest on the mesh. A rabbit needs a sturdy place to build their nest, so her kits will be warm and safe when they are born. 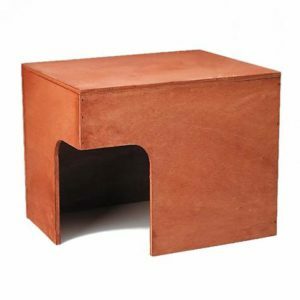 The WARE Wooden Nest Box for Chickens & Rabbits, is a nice simple nesting box that is the perfect size for a rabbit. 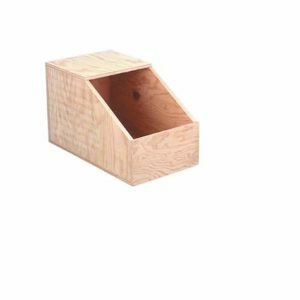 This nesting box is a simple drop in solution, you can add it to your cage once your rabbit shows any signs of nesting behaviors.